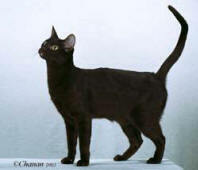 The Havana Brown is an "engineered" breed, in that the breed was developed by breeding black domestic cats carrying a brown recessive gene with a seal or chocolate point Siamese. In the very early part of the 20th century, the "self brown" Siamese came under disfavour. Over half a century later, the designed breeding was successful in developing a brown cat which was the forerunner of our present breed. The very first Havana Brown was registered in England in 1954. The breed as it appears today does not differ much from the early imports. The only big difference is that the breed has become a bit more refined. However, the original Havana look is still there. Pictured is Harvey who owns Michelle, a beautiful example of the Havana Brown. There is recorded history of solid brown cats in "The Cat Book Poems" dating back to between 1300 and 1767 from early Siam (Now Thailand). These ancient manuscripts were written in the city of Ayudha, between the time the city was founded and before the city was burned by invaders. Seventeen "good luck" cats are described including solid brown cats, which the Thai's considered very beautiful and had the ability to protect them from evil. The Havana Brown is unique to gaze upon, and even more delightful to enjoy as a companion. Blessed with a pixyish soft voice, the traditional Havana Brown usually exhibits the peculiar trait of using his paws to feel, touch, and investigate items as opposed to other breeds who characteristically use their sense of smell to investigate curious items. One of their endearing qualities is their typical greeting of elevating and stretching out one paw to touch their human friend, or offer a paw in friendship. These charming cats quietly require human companionship. Affectionately sociable, sweet, and considerate by nature, they are quite even-tempered, gentle, and intelligent. Havana Browns tend to use body language to get their point across, and this breed is known to take well to a harness and lead. Human companionship is a necessity for this breed. Most Havanas do not use their soft voices often, but they can cry loudly when they have lost track of their human companions. They are very playful, stealing pencils, pens, ear rings or whatever they can get into their mouths, much to the amusement and frustration of their owners. Most love to play with wads of paper and some have learned to retrieve. Havanas seem to be natural shoulder sitters; fortunately, claws are rarely used. Generally, they are very neat and tidy in their personal habits. They are very oral cats, usually bathing themselves and each other thoroughly several times a day. Changes to their environment are agreeably adapted to with remarkable confidence and poise. They have learned the art of give-and-take. This unflappable breed instinctively molds itself to your habits and is more dog-like in temperament because it seems willing to please. Diversified lifestyles, with children, elderly or all those in between are taken on with style and ease. Traditional Havana Browns crave and thrive on human attention, so be ready to share your household activities with this non-intrusive personality. With eyes that twinkle with curiosity, glow with mischief or narrow to pure contentment, they can captivate you with their permeating, discerning gaze. Expressive ears are almost always in constant motion, taking in their surroundings with great interest. Two features separate the Havana Brown from any other breed. The first, and most obvious is a glistening mahogany-brown coat. Medium short and close lying, it glows with reddish highlights and should be sound to the roots. The second feature is a distinctive "corn cob" muzzle that appears as if it has been added to the skull rather than flowing from it. Unlike any other breed of cat, the whiskers are the same brown as the coat. Kittens are born a lighter shade of brown. Tabby markings are common in young kittens, but generally fade as the coat darkens and evens out at around ten months of age. Havana breeders prefer to keep their kittens until they are four months old. By this time, the potential of the kitten is apparent, soundness of coat colour can be determined, eye colour is coming in and individual personalities are surfacing. Also by this age, the kittens have had their permanent shots and have been FeLV tested. Because of the occasional Traditional Russian Blue used in their ancestry, once in a while lavender kittens can be produced. This frost grey with a pinkish tone is accepted in TICA and CFF. Since TCA, Inc. represents only the Old Style of each breed, they only accept the original traditional Havana Brown.